Join the University of Roehampton Studentpad to get property alerts emailed directly to you whenever accommodation becomes available that matches what you are looking for! Whether it’s a student house, flat, lodging or shared housing; Studentpad will help you find your perfect student home in Roehampton. 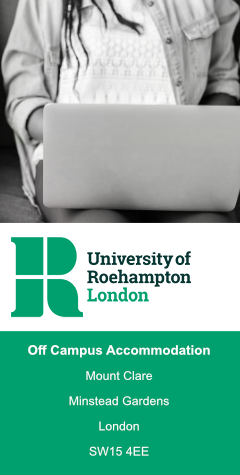 It is important that you register using your @roehampton.ac.uk email address as this is the account used by the University to communicate important information on all matters of relevance concerning you as an individual. In addition, Studentpad will automatically register Roehampton email addresses whereas delays could occur due to verifying/checking processes if you use a different email account.